Yurihama Mayor Masamichi Miyawaki visited the town’s sister city of Hawaii County last month, where he met with the recently re-elected Mayor Harry Kim and members of the Japanese Chamber of Commerce and Industry in Hawaii. During a courtesy visit with Mayor Kim, the two renewed the sister city agreement between Yurihama and Hawaii County and reaffirmed their commitment to, as well as the importance of, the sister city relationship. Mayor Miyawaki expressed his hope that the friendship as well as the cultural, educational, and business exchange between the two communities will continue to strengthen and expand with Mayor Kim’s support and cooperation. In June of 2014, Yurihama unveiled the Aloha Monument as it kicked off its first Aloha Carnival. The monument was constructed to commemorate both the 10th anniversary of the creation of the town through merging the former towns of Hawai, Tomari, and Tōgō, and to celebrate the ongoing friendship and exchange between Yurihama and Hawaii. The Aloha Monument is located in Yurihama’s Tōgō Hawai Seaside Park (near the Driving License Center and across the way from Hawai Yu~Town), against a breathtaking backdrop of the beauty of Lake Tōgō and the surrounding natural greenery. Attempting to capture just a bit of the aloha spirit, the monument is engraved with 2 hands making Hawaii’s shaka sign as well as a heart, making it a fun photo op for visitors to the park (especially couples!). 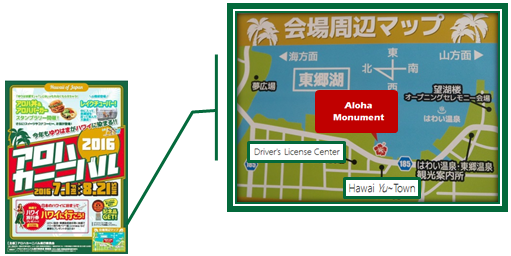 As part of this year’s Aloha Carnival (happening all throughout Yurihama July 1st through August 21st ), anyone can take their photo in front of the Aloha Monument to win a special prize!! Hawaii County and Yurihama first established their sister city relationship in 1996, and have worked to develop a strong friendship through cultural exchange, a junior high school student homestay exchange program, and various other projects and events. This year marks the 20th anniversary of that sister city relationship, and as part of the celebrations a commemorative tree planting ceremony was held on Thursday, February 18th, 2016, at Liliuokalani Gardens, which is a Japanese-style garden off of the island of Hawaii’s Hilo Bay. The ceremony was attended by Hawaii County Mayor Billy Kenoi and Yurihama Mayor Masamichi Miyawak i, as well as representatives from both Hawaii County and Yurihama’s legislative councils and chambers of commerce and industry. It was a lovely ceremony, with a blessing that as the black pine planted grows, so too would the friendship and exchange between Hawaii County and Yurihama, after which those in attendance each had the opportunity to scoop soil onto the base of the tree. If you have the chance to visit Hilo, I hope you take the time to see this symbol of friendship between Hawaii County and Yurihama and enjoy the tranquility of Liliuokalani Gardens.